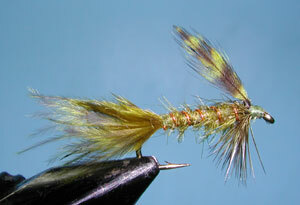 Notes: The Timberline Emerger was one of the first flies designed by Randall Kaufmann in the mid 1960's. It is named after the numerous timberline lakes that Randall would hike into from the Eastside Sierra areas out of Mammoth and Bishop. Randall felt that he needed a stillwater pattern that would be subsurface and would represent the caddis and mayfly emergers that many of the trout would feed upon just under the surface film. The fly is cast and retrieved with a slow hand twist. This fly continues to be popular throughout the Sierras and throughout the Pacific Northwest. Randall attributes the success of this fly to the natural grizzly wing tips which need to have a good barring and also a wide width that only hen hackles can provide. The wings are tied downward and divided with the curves facing away from each other. The tail was originally 4-5 strands of Dark Moose Hair, Randall replaced this hair with Marabou in the early 1980's since it provided better movement. 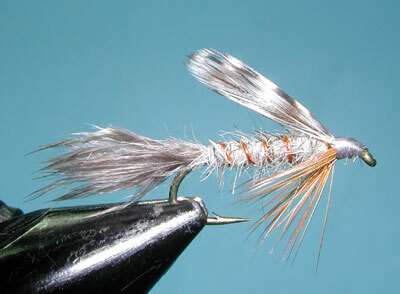 For the Gray Timberline Emerger, I like to use the natural gray marabou found at the base of Ringtail Pheasant Body feathers. 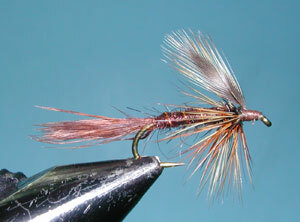 The hackle is is tied sparsely with only 2-3 turns. The fibers are stroked down and swept back secured with thread wraps. 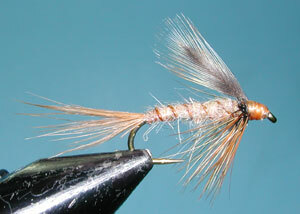 The hackle fibers should not extend beyond the hook point. Many guides consider this a must-have fly for High Sierra lakes with Goldens and Rainbows.